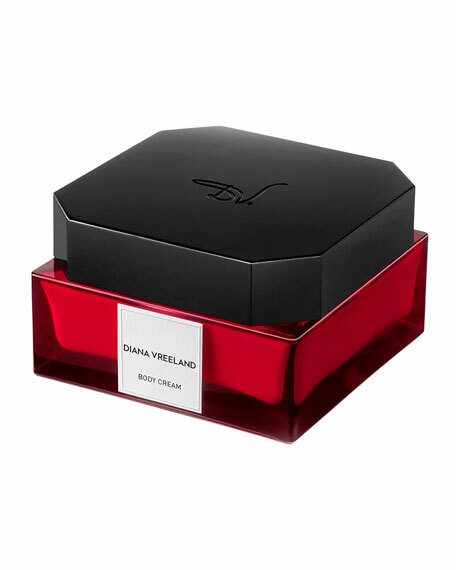 The Diana Vreeland Body Cream is a luxurious sensorial experience crafted around the essence of rose water. Rich with natural ingredients, and a hint of jasmine and musk, the cream nourishes and quenches the skin. Its light formula leaves a soft, satiny finish and your skin will feel moisturized for hours. The body cream is expertly created to evoke a delicate scent that can be worn alone or layered with your preferred Diana Vreeland fragrance. Let the jar's elegant red glass base and lustrous black beveled lid grace your vanity with grandeur. Pamper yourself with the Diana Vreeland Body Cream after the bath or shower, morning or night, all over the body. 200 mL/ 6.7 fl. oz.